Embroidering florals and other designs at a very tiny size is fun and rewarding. They finish quickly and are often something you can wear when it's finished. But what do you do with the embroidery? 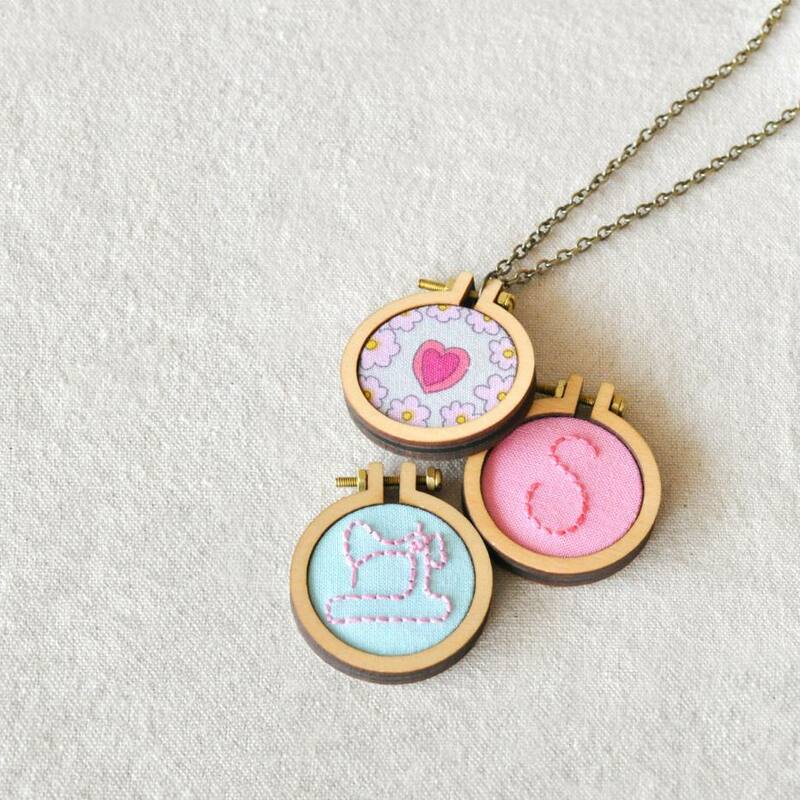 Finish off your work with tiny hoops and framing pieces that are as adorable as your work. These hoops aren't designed for stitching because most have a solid center that holds your work in place. But when you're talking about something that is only 1 to 2 inches, you probably want to stitch in a slightly larger hoop anyway. Also, take note that many of these will require you to permanently attach your stitching to the hoop. When making a jewelry piece, especially as a gift, that's a good thing. Just don't plan to change out the contents over time. Now, get ready to take a look at the cutest, tiniest hoops you'll ever see. For a classic hoop that perfectly frames your tiny stitching, check out Dandelyne's hoop kits. They come in several sizes, both as circles and ovals. And when it comes to construction, these hoops will finish your stitching off beautifully with a smooth back covered with wood. In addition to more standard shapes for tiny embroidery hoops, Selina Hudson Designs also has some very unique pieces. A perfect example is the owl, which has three spaces for embroidery. You'll love all of the hoop shapes she makes. Having some color around your stitching is a great way to finish your project. The tiny hoops from Song Thread provide you with a rainbow of options. In fact, they have 17 different colors and finishes. There's no need to decide which ones you want right away because they're also available as a multi-pack in two sizes. For a sleek finish, try framing your tiny embroidery in a metal frame. The pendant and brooch blanks from Kailea come in both a silver and gold finish and in a variety of sizes. Many of the shapes border on the avant-garde, so they're perfect for giving your tiny work a modern flair. Scalloped edges finish off a project with maximum cuteness, and these adorable and colorful hoops do just that. Julia from Stars and Sunshine creates them on a 3D printer, which makes them extra cool. You can make them into necklaces or add a pin back. While you're there, take a look at the larger scallop hoops. The scallops on this wooden hoop are so adorable. In addition to the walnut, Wayv Designs offers other wood choices, including alder, bamboo, and birch. They have even more styles and designs, including heart, teardrop, and Victorian-style pendants and wood cross-stitch blanks. While the trays are not designed specifically for embroidery, they make very nice frames. Some come with glass cabochons which your embroidery can wrap around, or you can cut a piece of acid-free cardboard to hold your work in the tray. These tiny scalloped hoops from Teeny Tiny Vintage are a little different from the others because they also have hearts on them. What a sweet way to frame an initial for a little girl—or for yourself. The slightly sheer acrylic comes in bright colors, but be sure to check out this seller's other wooden hoops. You'll find bunnies, rectangles, half moons, and more. From pointy hexagons to triangles with smooth rounded corners, Maven Embroidery Art has some very neat hoops. Building off her own embroidery work, Susan offers unique shapes that will certainly appeal to the modern crafter. Made of high-quality, 6 mm-thick wood, each kit includes everything you need to frame up your mini creations. When you're just starting to work with miniature pieces, it can be hard to know where to start. Is a 2-inch hoop going to work better for you than a tiny 1.1-inch hoop? There's no need to make a decision with Sew Cross Handmade's multi-pack of oval and circle hoops. Five wooden hoops are included so you can test them out and see just how small you can go.